Concerned communities tackle speeding, reckless driving to preserve neighborhood safety and improve quality of life. “I feel the need … The need for speed!” exclaimed Top Gun flyboys Maverick and Goose during a famous, and oft quoted, scene in this classic action flick, one that still resonates with daredevils everywhere. Disturbingly, our infatuation with high speed leads many motorists to forget that their Toyota is not an F-14 Tomcat and that our often crowded public highways, byways, and roadways are far less forgiving than the friendly skies! In addition to the tens of thousands of drivers and vehicle occupants who die in traffic crashes each year, more than 4,000 pedestrians are killed by motor vehicles. A 2011 National Highway Traffic Safety Administration (NHTSA) report revealed that pedestrian deaths accounted for 12 percent (4,092) of all traffic fatalities and 3 percent (59,000) of all people injured in traffic crashes in 2009. Motorists who speed, drive recklessly, or who are distracted or impaired are at greater risk not only of causing crashes, but also of failing to react in time to be able to prevent them. Especially hazardous are streets in residential areas, where drivers often must negotiate a myriad of obstacles—from joggers and cyclists to children playing, loose pets, trash containers, parked vehicles, and more. In fact, NHTSA data indicates that, when measured per miles driven, the death rate on residential streets is more than twice the highway death rate. In virtually every American community, speeding in residential areas is the most common—and most challenging—complaint law enforcement agencies receive from residents. Unfortunately, enforcement campaigns yield limited results simply because public safety agencies cannot patrol every single street and roadway 24-7. Likewise, devises such as speed humps, while useful, are not always practical or desirable. This is why many community groups have decided that unsafe residential driving issues are best solved using a multi-pronged approach that involves all sectors of the community and combines enforcement, citizen engagement, and education. Residents with traffic complaints are first asked to complete a request for service application that identifies the location and nature of the infraction(s). Next, applicants must select the calming devices or services desired, from a list of options that include speed humps and cushions, radar speed signs, traffic circles, and speed monitoring. SDOT staff review all submitted forms, and if a complaint is deemed suitable for consideration, invite the applicant to enroll in the Seattle Traffic Calming Program. To ensure broad community support, a minimum of four neighbors must sign the enrollment form. SDOT encourages applicants, and at least one signer, to attend a regularly scheduled neighborhood traffic safety meeting to discuss traffic calming options and be trained to use a radar speed gun. During the next step in the process—neighborhood speed monitoring—resident volunteers use the radar device to collect and document vehicle speeds on their street. Typically, two people are needed to complete this task—one to measure vehicle speeds and read out license plate numbers, and a second one to complete the forms, which are forwarded to SDOT. City staff then sends letters to drivers, whose speed was measured at more than 30 miles per hour. Finally, SDOT staff reviews the data from the radar device and uses it to determine the approximate traffic volume and to calculate the “85th percentile speed”—the “at or below” speed at which 85 percent of drivers are traveling. Based on its findings, the department then works with residents to develop appropriate community-oriented, traffic-calming measures, which may include signage, parking management, driver awareness campaigns, and other tools. One of Seattle’s most creative—and colorful—traffic-calming solutions is a gargantuan insect, affectionately known as the Wallingford Ladybug. Located at the intersection of 49th Street and Burke, the ladybug is actually a street mural designed by landscape architect Eric Higbee and painted by neighborhood residents in 2006. Since then, the ladybug has been joined by Bubbles the Turtle in Seattle’s Fremont neighborhood and a handful of street mural artwork at other intersections. To participate in this unique program, resident Rembrandts must submit their mural design to the SDOT Neighborhood Traffic Operations division for pre-approval. The design must be accompanied by a petition of support signed by at least 60 percent of all residents and businesses located within one block of the proposed mural location. Seattle’s “street art” is one of many dynamic residential safe driving programs being launched nationwide. Tom Everson, founder of Keep Kids Alive, Drive 25 (KKAD25), has worked with law enforcement agencies, neighborhood and civic organizations, city services agencies, and businesses in more than 1,300 communities across America to develop innovative traffic safety initiatives. Most often, he explains, “communities begin by assembling a traffic safety task force comprised of neighborhood residents, area school officials, businesses in or near the target neighborhood, traffic engineers, law enforcement, and sometimes even city council members. The purpose of the task force is to look at what we need to do to engage and educate the community,” he said. Most task forces identify speeding and running red lights or stop signs as the most common infractions observed in residential neighborhoods, which according to Everson, mirrors national statistics. He cites a joint Safe Kids-FedEx study that revealed that less than 30 percent of observed drivers braked correctly at stop signs. (II) Together, KKAD25 and task force members address these issues, often implementing driver awareness campaigns that feature messages such as: “Stop. Take 3 to See,” “Be Aware. Drive with Care,” and “It’s Not a Race! Create Space.” Follow-up studies suggest drivers do take these messages to heart. 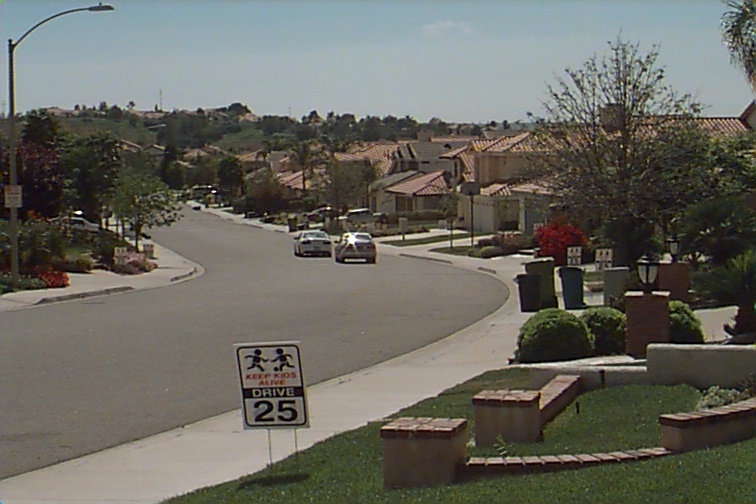 One California pilot project resulted in a six mile-per-hour reduction in average speed when neighbors placed signs in their yards reminding drivers to slow down. 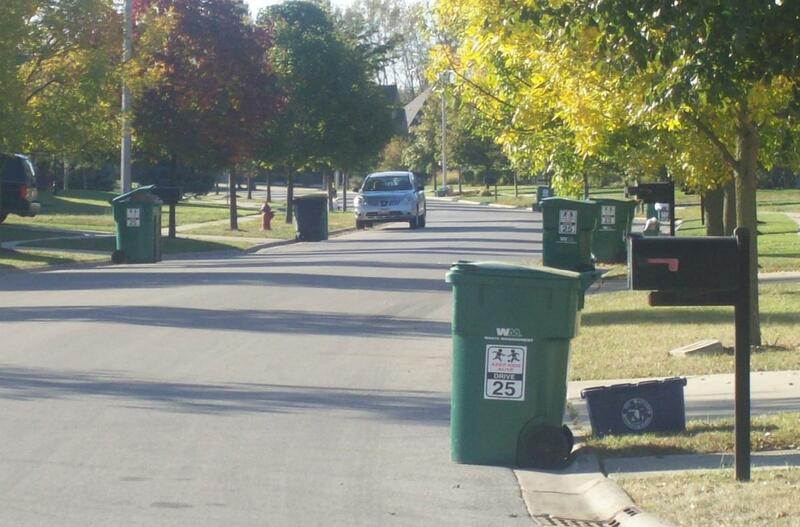 In Tucson, Arizona, residents, local Boy Scouts, and a public utility company collaborated to fund and launch a trash container decal campaign that resulted in a residential speed decrease to an average of 24 miles per hour (see photo). Safe Cycling: In 2009, 630 cyclists were killed and an additional 51,000 were injured in accidents with motor vehicles. Approximately 30 percent of all cycling fatalities occurred along non-urban streets. (V) According to NHTSA, wearing a properly fitted helmet is the single most effective way to prevent head injury—the leading cause of death in motor vehicle/bicycle accidents. Other smart safety measures include outfitting cycles with reflectors or flashing lights and for cyclists to wear fluorescent or brightly colored clothing to increase visibility. Above all, bicyclists should remember that they are legally considered vehicle operators and must abide by the same “rules of the road” as those operating motor vehicles. Bicycle “rodeos” and safety events are a fun way to educate children (and adults!) about safety. Typically held at centralized neighborhood venues (e.g., school parking lots) during summer months, “rodeos” usually involve law enforcement bicycle patrol officers, who guide the children and youth through obstacle courses designed to teach safe cycling techniques. Some events even include volunteer technicians, who inspect and make minor tune-ups to participants’ bicycles. These events also offer neighborhood groups the chance to meet fellow residents and share crime prevention and community safety information. If invited, local businesses may agree to fund promotional safety items, such as fluorescent “jogger’s” arm bands, to distribute to attendees. Clear the Way: Overgrown foliage and trash heaps not only provide criminals with cover while they commit crimes, they also obstruct driver and pedestrian visibility. 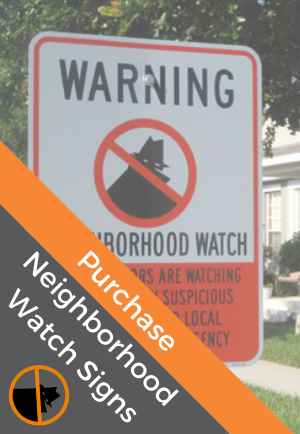 Many neighborhood crime prevention and homeowners associations organize periodic volunteer cleanup and landscaping events and, in conjunction with law enforcement, offer residents complementary home exterior safety and security assessments. In addition to pruning shrubs and removing litter, volunteers should inspect sidewalks and other pedestrian pathways to ensure that they are in good repair and don’t pose a tripping hazard to pedestrians. Crumbling, cracked, and flooded walkways often force pedestrians, including children and mobility-impaired individuals, to make unsafe detours into the vehicle travel lanes of busy streets. Regulations regarding sidewalk maintenance vary by locality. Some jurisdictions allow residents to make elective repairs at their own expense, while others pay a percentage of the costs. In other communities, homeowners are required to maintain walkways bordering their property. Before initiating any sidewalk repairs, neighborhood groups should contact the appropriate governmental agency to ensure compliance with local ordinances. “I’ve never had anyone say to me ‘I wish the city would raise the speed limit on my street,’” Everson said, underscoring the ongoing need for residential traffic-calming programs and initiatives that engage all segments of the community. By reaching out to city officials, law enforcement, and other stakeholders, neighborhood leaders can become a catalyst for changes that lead to measurable improvement in driver and pedestrian safety in their residential neighborhoods.